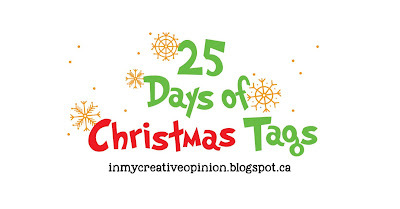 Hi all and welcome to the start of the 25 Days of Christmas Tags event hosted by the fabulous Tracey McNeeley aka In My Creative Opinion ! 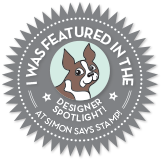 This is the 8th year that Tracey has hosted this event and Simon Says Stamp is thrilled to get the ball rolling on Day 1! Each day up to November 25th there will be a different company sponsoring with fabulous crafty give aways and prizes to be won PLUS the company design teams will be joining in with lots of gorgeous Christmas Tags for our inspiration! For my tag I used Critter Sweaters Stamp, Critter Sweaters Dies, and Stitched Dress Up Tag Dies. I'm in love with the cute Critter Sweaters Stamp and Critter Sweaters Dies, these days. The biggest bear dies just looks perfect for stand alone tag, isn't it? 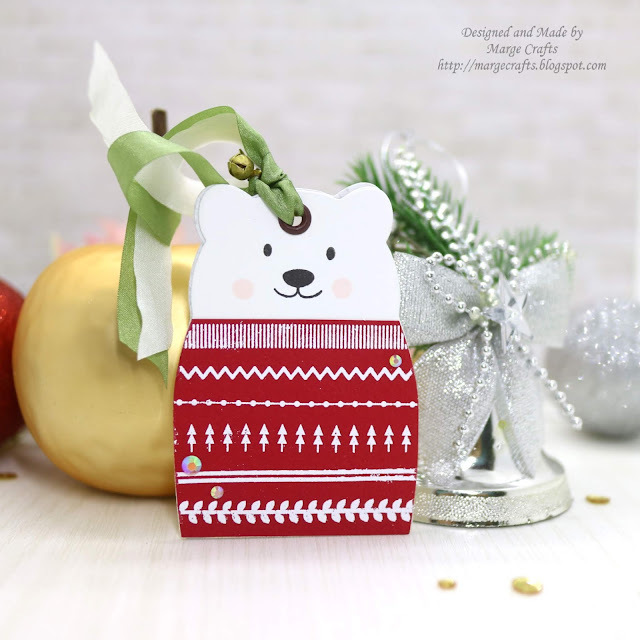 For my first tag , I cut papers from Knit Picky 6×6 and Rainbow Christmas using Stitched Dress Up Tag Dies, then I assembled the tag. 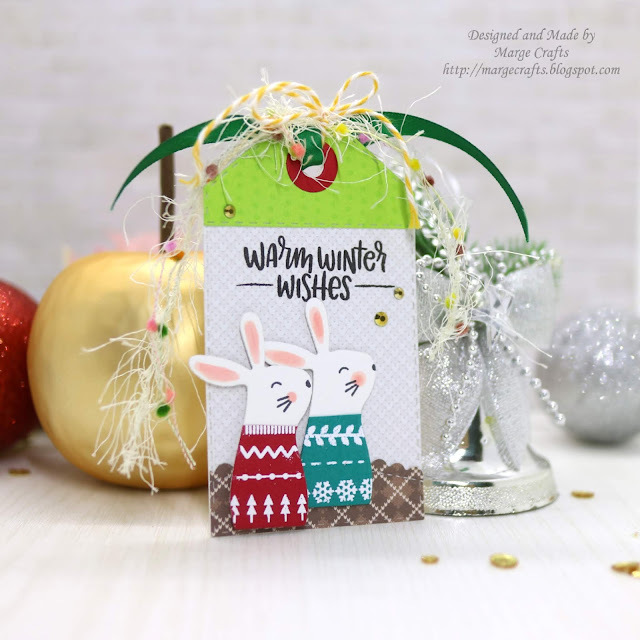 I stamped a sentiment from Critter Sweaters Stamp, and adhered little bunnies in sweaters I made using Critter Sweaters Stamp and Critter Sweaters Dies. Before adhering bunnies, I put small hill made with Knit Picky Fall 6×6 and Wavy Scallop Stitches dies. 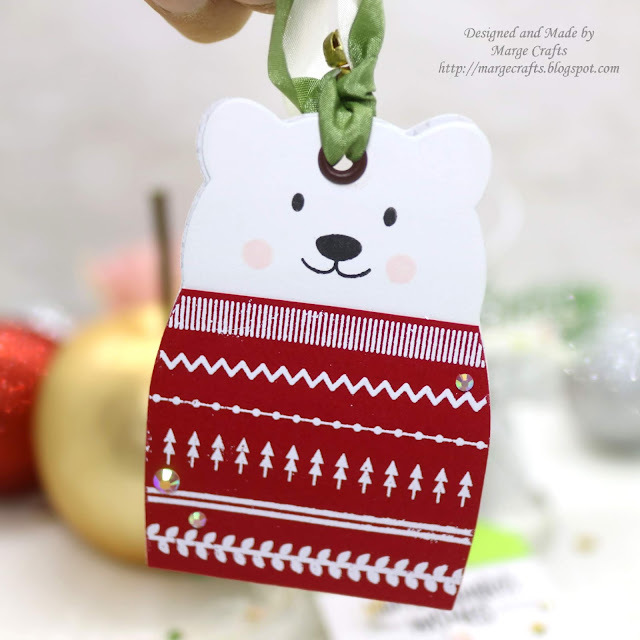 For my secon tag, I made two layers of big bear diecuts using Critter Sweaters Stamp and Critter Sweaters Dies, punched a hole on top, then inserted an eyelet . The sweater patterns were heat embossed in white on red colored Neenah Texture Cardstock. I added Ivory Jewels for embellishment. As you can see in the first picture, I stamped a sentiment on the back layer. I used various ribbons, yarns, twines, and a Tiny Jingle Brad in my stash to embellish my tags. 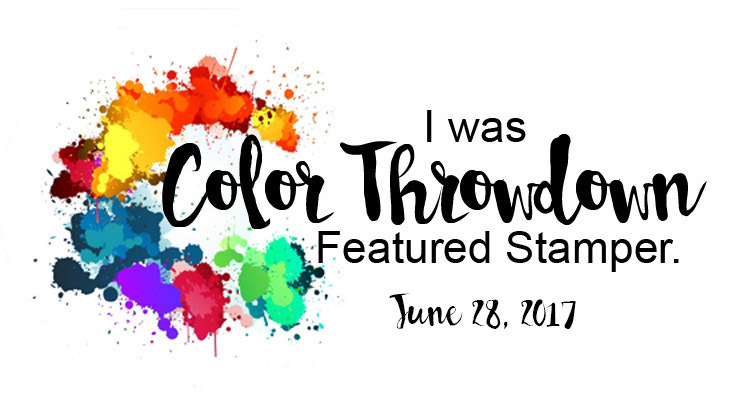 CLICK HERE to visit Tracey's blog where there is more information about how you can win the fabulous prizes on offer! 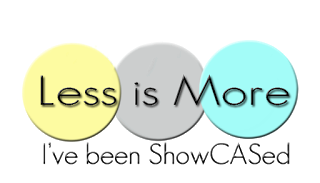 There are lots of ways to win prizes and it is a little long winded so I am referring everyone to Tracey's blog for more info. 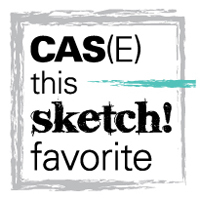 Participate by creating your own tags. 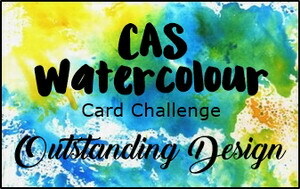 The rules for participating are simple, you MUST create a Christmas tag inspired by a tag you see during the event and you MUST state in your post the day and whose tag you were inspired by in order to be eligible for a prize. Enter as many tags as you like. To keep is fair for everyone, only one comment per post please. 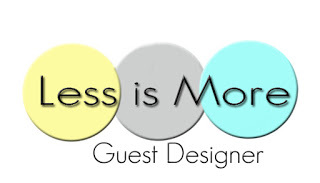 You may however create as many tags as you would like as long as you follow the rules. The more you hop along and comment and the more you participate the more chances you have of winning! Love your tags Marge, the critters/sweaters ARE sweet and your bear tags is just precious! TFS! Three cheers for Christmas sweaters--your tags are great! Adorable and super cute tags!!! 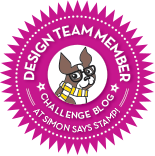 Marge, I love the critter tags you created! They are gorgeous! The little critters are a perfect size for tags! Great job, Marge! So cute with these critters and the sweaters. Your tags are darling, Marge. LOVE them both! Thanks for the fabulous inspiration. 2 gorgeous tags Marge :-) the little bunnies in their sweaters are super cute and I love the bear tag! absolutely fabulous!! I LOVE your tags! The bunnies in the sweaters are darling! 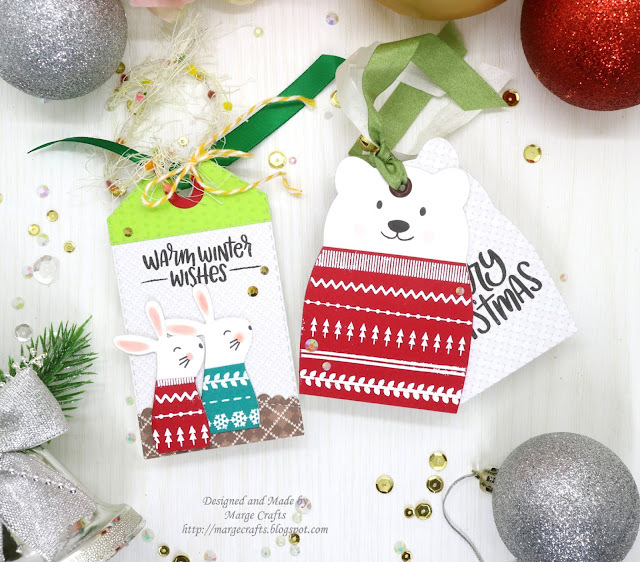 Oh what sweet, fun and festive tags - fantastic! 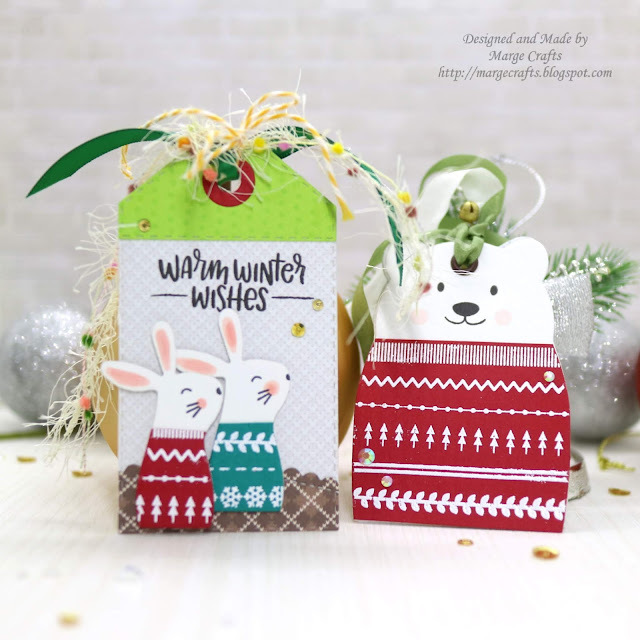 I love these tags - the critters look warm and cozy. I especially love the sweater-clad bunnies! Great Tags! The bear is adorable! Omg, I love the fair aisle looking sweaters! Very cute tags. The Fair Isle design makes them seem more Christmasy. These are so adorable, Marge! 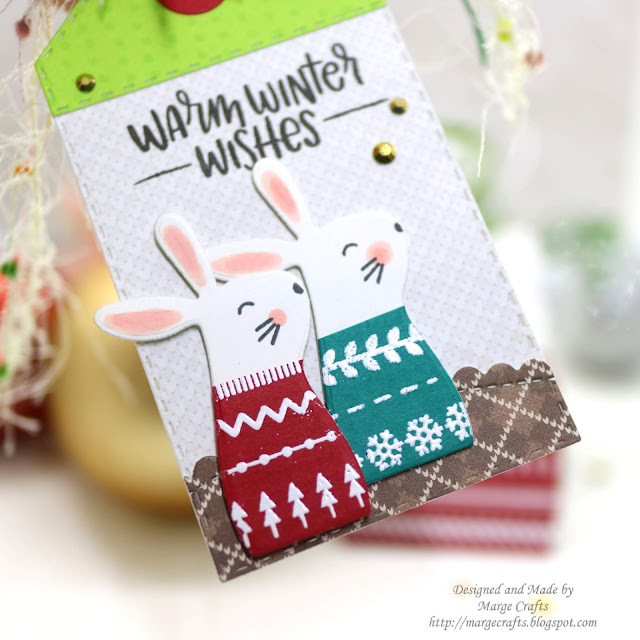 I love both tags (and the stamp sets), but those little bunnies in their winter sweaters just steal my heart! Thanks so much for sharing. These are really cute! The animals are darling in their sweaters. What a cute stamp and die set!